Urag gro-Shub takes a bite to eat. Urag gro-Shub is an Orc mage and the librarian of The Arcanaeum at the College of Winterhold. He is a Wizard of the College of Winterhold as well. He is a serious book collector and merchant, and supplies you with research materials concerning the Eye of Magnus during the quest Hitting the Books. Urag can make you Blood-Kin with the Orcs (After completing the Fetch me that Book! quest) if you have not already earned this through other means. After completing the quest Alduin's Bane, it is possible to sell the Elder Scroll to Urag for 2000 gold. This is the only way to remove the artifact from your inventory, without installing Dawnguard. Urag may greet you by saying: "I don't care if you wrote it yourself -- if you want a book from here, you go through me." or "The Arcanaeum is always accepting new volumes. I'll take what I can get." After you have joined the College Of Winterhold and go and speak to him, he will acknowledge you as a newcomer and say: "You are now in the Arcanaeum, of which I am in charge. It might as well be my own little plane of Oblivion. Disrupt my Arcanaeum, and I will have you torn apart by angry Atronachs. Now, do you require assistance?" When you become Arch-Mage, he might greet you with one of the following lines: "Greetings, Arch-Mage." or "May I help you, Arch-Mage?" or "I'm not one for commendations, but I might've lost everything that matters. So... thanks." or "Arch-Mage or not, my rules about books still stand." or "All this knowledge might have been lost, were it not for you." Before you become Arch-Mage, he may greet you with one of the following lines: "I don't want to see you treating any of these books poorly. Are we clear?" or "Hundreds of years have gone into assembling this collection. It's going to stay pristine, understand?" or "You need a book, you talk to me. Otherwise you're going to find yourself in a lot of pain." When asking him what he has got for sale, he might say: "Assorted books, scrolls... I'm sure you'll find something useful." or "I have a few things that weren't worth adding to the collection. You may look through them." or "Please make sure your hands are clean before touching anything, all right?" In conversation, if you mention the fact he takes his work very seriously, he will say: "Of course I do. If I didn't, most of the books would've been burned to ashes or dissolved to nothing before the Third Era. Mages need to be reminded to be careful around research materials." If you tell him the Arcanaeum is an impressive library, he will say: "A mage is only as good as what he knows. I try and make sure as much knowledge is available as possible. We've been keeping this collection since the Second Era. Books have come and gone during that time, but it's mostly intact." If you are expelled before Savos Aren dies, he will only greet you by saying: "I'm sorry, but you've been suspended from the College. I can't be seen talking to you right now." If you are expelled after Savos Aren dies, Urag will only greet you by saying: "You've been suspended from the College for what you did. You'd better talk to Tolfdir to get it sorted out." Urag carries an orcish dagger. He wears adept robes of conjuration and a pair of boots. He knows the Destruction spell Frostbite and the Restoration spells Fast Healing and Lesser Ward. Forgotten Vale Books QuestDG: Bring the Ancient Falmer Tome to Urag gro-Shub. After completing the quest Alduin's Bane, you can ask him if he would be interested in the Elder Scroll you have. If you do ask him this, Urag will be slightly angry and will say: "Very funny. Did Enthir put you up to this?" You now have two dialogue options. You can tell him you are serious, and that it's his if he wants it, at which Urag will be puzzled and will reply by saying: "You... Really? An Elder Scroll?" If you instead say that you'll find someone else who wants it, Urag will be incredulous: "Wait. Are you... Are you serious? You have an Elder Scroll? You?" Either way, he will be awed and continue with: "I would be honored. Beyond honored to have such a thing here at the College. This opens up entire new realms of research for us. Oh, if only Septimus were here to see this! Thank you. Please, take this. It can't quite compare to an Elder Scroll, but still. You will be remembered for generations for this." Urag will then give you 2,000 gold in exchange for the Elder Scroll. If you have sold the dragon Elder Scroll to Urag but need it for Scroll Scouting, you can return to Urag and request to repurchase it. Urag is not surprised your desire to repossess it: "Finally came to your senses, eh? Realized what you gave up? Can't say I'm surprised. ", and then offer to sell the scroll back to you, but for double the price he bought it for, "Tell you what, I'll sell it back to you for 4,000 coins." (if you leave without buying and come back he will say, "Back, huh? Well, price is still 4,000 coins."). If you turn down his offer he will sarcastically say, "Hey, if you don't like it, you could always shop for your Elder Scrolls elsewhere." You can attempt to persuade him to take 3,000 gold for the scroll. If you are successful he will agree: "All right, I suppose I could do that. Here you are." or if you are unsuccessful: "No, sorry. It's 4,000 coins or no deal." If you are the Archmage you can tell him to take the same 2,000 gold he paid for it to which he will begrudgingly agree: "Oh, very well. I don't know how you expect me to keep this place in order when I can't make a profit." If you accept his initial offer or fail the persuasion attempt and then agree to pay up he will say, "Been a pleasure doing business with you." During this quest, You can tell him you need to learn about what you found in Saarthal, he will reply by saying: "I know what you want. Word travels fast around here. Discovered some big mystery, huh? Well you don't even need to ask. No, I don't have anything for you. Not anymore, anyway." If you then ask him if he has anything that may help, he will say: "I said not anymore. Orthorn stole a number of books when he ran off to Fellgow Keep to join those Summoners. Some kind of peace offering. I think one of those volumes may have had some relevant information. If you want them, you'll have to talk to Orthorn." You can now go and find Orthorn at the Keep, but you can ask Urag some questions before departing the College. You can ask him who Orthorn is, he will reply by saying: "He was an Apprentice here at the College. Not very skilled, but got involved with a group of mages who took a liking to him. When they left, he took off after them. Stole supplies and books from the College, I suppose as a way to ingratiate himself." You can ask him why the mages went to Fellgow Keep, to which he will respond: "Let's just call it a difference of opinion with the College. They were interested in research that goes outside the bounds of what the College allows, so they were... persuaded to leave." You can also ask him if anyone cares about Orthorn stealing things from the College, to which he will respond by saying: "Not enough to bother with it. Arch-Mage Aren's approach to these things is to just let them sort themselves out. Although now it looks like you'll be doing the sorting. Good luck with that." Upon returning, you can tell Urag you have found the books that went missing, to which he will reply by saying: "Well, well. And you seem to be in one piece! Thank you. I'll look these over, and inform Mirabelle if I find anything relevant. Night of Tears, eh? I remember this one. Well, isn't that interesting. Did you read it yourself? If I recall it correctly, that has some interesting implications. You should mention that to Tolfdir. And... here. I suppose you've earned these." He offers exactly the same dialogue during the part he plays all these quests. When telling him you're looking for an Elder Scroll, he will reply angrily, saying: "And what do you plan to do with it? Do you even know what you're asking about, or are you just someone's errand boy/girl?" 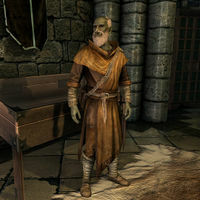 You then have two dialogue options with him, you can ask him to tell you more about the Elder Scrolls, to which he will reply in a bit of anger and disgust, saying: "I knew it. Everyone comes in here, expecting my help, but they don't even have the proper questions. An Elder Scroll is an instrument of immense knowledge and power. To read an Elder Scroll, a person most have the most rigorously trained mind, or else risk madness. Even so, the Divines usually take the reader's sight as a price." If you instead ask him if he has one here, he be a little surprised and puzzled and will reply by saying: "You think that even if I did have one here, I would let you see it? It would be kept under the highest security. The greatest thief in the world wouldn't be able to lay a finger on it." A price for what? : "The simplest way to put it is "knowledge," but there's nothing simple about an Elder Scroll. It's a reflection of all possible features and all possible pasts. Each reader sees different reflections through different lenses, and may come away with a very different reading. But at the same time, all of it is true. Even the falsehoods. Especially the falsehoods." Who wrote the Elder Scrolls? : "It would take a month to explain to you how that very question doesn't even make sense. The Scrolls exist here, with us, but also beyond and beneath. Before and after. They are bits of Divine made substance so we could know them. Sorry. Talking about the scrolls, you usually end up in irritating and vague metaphors like that. Some people who study them devoutly go mad." All right. So do you have one that I could use? : "Ha!" What about the Dragonborn? : "What about... wait. Are you? Were you the one the Greybeards were calling?" Do you at least have any information on them? : "Of course." I need to find one and was told you could help: "I don't know who told you that, but I'll do what I can. What we do have here are plenty of books." Any three of these dialogue options will lead to him saying: "I'll bring you everything we have on them, but it's not much. So don't get your hopes up. It's mostly lies, leavened with rumor and conjecture." Urag will then leave his spot behind the counter and gets two rare books for you, Ruminations on the Elder Scrolls and Effects of the Elder Scrolls. The first book is written by Septimus Signus and starts the concurrent quest Discerning the Transmundane when opened. As he returns to the counter, Urag will again advise you to keep his books intact, saying, "Here you go. Try not to spill anything on them." After reading the Ruminations book, you can tell him it's incomprehensible. He will then say: "Aye, that's the work of Septimus Signus. He's the world's master of the nature of Elder Scrolls, but... well. He's been gone for a long while. Too long." Where did he go? : "Somewhere up north, in the ice fields. Said he found some old Dwemer artifact, but... well, that was years ago. Haven't heard from him since." He's dead? : "Oh no. I hope not. But even I haven't seen him in years, and we were close. Became obsessed with the Dwemer. Took off north saying he had found some old artifact. Haven't seen him since. Somewhere in the ice fields, if you want to try and find him." You can see him regarding this Moth Priest during this quest. Upon telling him you need to find a Moth Priest, he will be surprised and say: "A Moth Priest? What in Oblivion do you need a Moth Priest for?" Upon telling him your business is your own and that you just want to know, he will say: "Fine, fine. No need to get your breeches in a twist. The obvious answer is to go to the Imperial City. The Moth Priests make their home in the White Gold Tower. Sometimes they go out looking for Elder Scrolls. Lucky for you, there's a Moth Priest in Skyrim right now, doing just that. He stopped in to do some research in the library, then left for Dragon Bridge. If you hurry, you might catch him there." "If you're feeling adventurous, I'm always looking for someone to procure valuable books from some more... dangerous locations." "There are more books to be recovered and secured here in the Arcanaeum." "There are more books to be recovered and secured in the Arcanaeum." "Well all right. Here, I scribbled down the last place I'd heard about. Check it out, and be careful." "All right. I wrote down the last place I'd heard about. Don't get killed." "Ah. Some other time, perhaps?" Upon returning, you can tell him you have found the book he was looking for, and he will reply saying: "Looks like you're still in one piece. And more importantly, so is the book. Thank you." Upon finding an ancient Falmer tome, you can see Urag about it and ask him if he has an interest in them, he will respond by saying: "Well, well. I haven't seen one of these beauties in a long time. A rare find in the original falmer language. You're damn right I'm interested. Question is, are you selling?" You can then tell him it depends how much he is paying, to which he will respond by telling you: "Well, considering no one else in Skyrim would buy something they couldn't possibly read, I'd say you don't have much of a choice. Tell you what, you bring me books like this, and I'll pay a thousand gold each. I'll even throw in a translated edition I have for free. Interested?" You now have two dialogue options with him. If you say it's a deal, he will say: "Here you go." This dialogue option will get you a translated copy of the tome and 1000 gold. For the second dialogue option, you can say you will think about it, to which he will respond by saying: "Suit yourself. I'm not going anywhere." If you find another falmer tome after this, you can tell Urag and he will say: "My offer is still a thousand. Did you want to sell?" You now have two dialogue options with Urag. If say it's a deal, he will say: "Here you go." This dialogue option will get you a translated copy of the tome and 1000 gold. If you tell him you will hold onto it, he will tell you: "If you're holding out for more gold, it's never going to happen." Upon joining the College of Winterhold, If you ask him if there are any special books he is looking for, he will say either "As a matter of fact, there are. Have you ever heard of Shalidor? Immensely powerful mage, back in the First Era. Had an understanding of magic few have ever matched. He holed himself up in Labyrinthian, and devoted all of his time to research and study. Wrote more than you would imagine possible. Since then, his writings have been scattered all over Skyrim, but are little use to anyone who can't translate them. I'm one of the few who can." or "I'm always trying to find more of Shalidor's writings." He will end with "I've heard whispers of more of his work having turned up. If you can track it down, it may prove useful to all of us." Upon returning with Shalidor's writings you can tell Urag you have found the writings, and he will say: "Excellent! I'll start translating it. Shouldn't take me more than a day or two." If you immediately ask him if he has made any progress translating Shalidor's work, he will be mildly annoyed: "I only just got my hands on it. I can only work so quickly." Asking him at least three hours later will have him reply, "It's coming along slowly. I expect there will be some results soon." After a full day, he will finally have the results, telling you, "We were able to figure out the last text you brought in. I thought the least I could do is pass the knowledge along." and rewarding you with three copies of "Shalidor's Insights" scrolls from a random school. This quest is repeatable. If repeated, he will retain the same dialogue but when briefing you with the task, he will only say: "I'm always trying to find more of Shalidor's writings. I've heard whispers of more of his work having turned up. If you can track it down, it may prove useful to all of us." This is the merchandise found in Urag's merchant chest. The items are only available if purchased from the merchant; they cannot be pickpocketed or stolen. They are restocked every two days. Urag gro-Shub also appears in the Clockwork City card set from the story expansion Return to Clockwork City for Legends as the card Arcanaeum Librarian. This page was last modified on 11 March 2019, at 19:17.